Metamorphosis is perhaps best known among insects and amphibians (organisms such as frogs, toads, and salamanders that can live either on land or in the water). However, the process of metamorphosis has been observed in at least 17 phyla (a primary division of the animal kingdom), including Porifera (sponges), Cnidaria (jellyfish and others), Platyhelminthes (flat worms), Mollusca (mollusks), Annelida (segmented worms), Arthropoda (insects and others), Echinodermata (sea urchins and others), and Chordata (vertebrates and others). In addition, although the term metamorphosis is generally not applied to plants, many plants do have a developmental life cycle—called the alternation of generations—which is also characterized by a dramatic change in overall body pattern. Metamorphosis in an organism is generally classified as complete or incomplete. 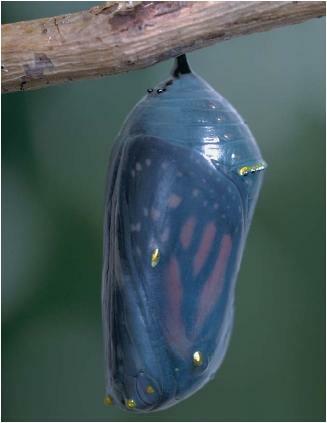 Complete metamorphosis involves four stages: egg, larva, pupa, and adult. Consider the sequence of these stages in an insect. After a fertilized egg is laid, a wormlike larva is hatched. The larva may look like the maggot stage of a housefly or the caterpillar stage of a butterfly or moth. It is able to live on its own and secures its own food from the surrounding environment. After a period of time, the larva builds itself some kind of protective shell such as a cocoon. The insect within the shell, now known as a pupa, is in a resting stage. It slowly undergoes a fairly dramatic change in its body structure and appearance. The energy needed for these changes comes from food eaten and stored during the larval stage. When the process of body reorganization has been completed, the pupa breaks out of its shell and emerges in its mature adult form, also called the imago. Alternation of generations: A general feature of the life cycle of many plants, characterized by the occurrence of different reproductive forms that often have very different overall body patterns. Imago: Adult form of an insect that develops from a larva and often has wings. Larva: Immature form (wormlike in insects; fishlike in amphibians) of a metamorphic animal that develops from the embryo and is very different from the adult. Molting: Shedding of the outer layer of an animal, as occurs during growth of insect larvae. Pupa: A stage in the metamorphosis of an insect during which its tissues are completely reorganized to take on their adult shape. Incomplete metamorphosis involves only three stages, known as egg, nymph, and adult. When the fertilized egg of an insect hatches, for example, an organism appears that looks something like the adult but is smaller in size. In many cases, winged insects have not yet developed their wings, and they are still sexually immature. In this form, the insect is known as a nymph. Eventually, the nymph reaches a stage of maturity at which it loses its outer skin (it molts) and takes on the appearance of an adult. These stages can be seen in a grasshopper, for example, which hatches from its egg as a nymph and then passes through a series of moltings before becoming a mature adult. What would an animal with neither a complete metamorphosis or in complete metamorphosis be? Can u name some organisims that do (or dont)do this? The Answer of the Article was good. It properly explained the Definition of Metamorphosis and the forms of Metamorphosis. Some definitions given in this Article was quite helpful for Understanding the CONCEPTS behind the Metamorphosis! is a complete meteamorphosis when it can develp into an adult. and is incomplete metamorphosis when it cant devep into a adult?